August 9, 2017 July 14, 2017 / Julie Brook, Esq. Some trial exhibits can be quite interesting and the jurors may want a close look at them. But is it a good idea to pass your exhibits to the jurors? Your Honor, may I _ _[request that the clerk]_ _ hand that exhibit to the jury and request that they pass it down each row so that each juror can _ _[read it/look at it more closely]_ _? Distracting. Jurors may be distracted from the testimony that’s being presented while they’re passing and examining an exhibit. Misleading. If the exhibit is detailed or lengthy, jurors will gain little from the brief look they can get while it’s passed, and the look they do get may be more misleading than helpful. Damaging. An exhibit of several parts can get shuffled, and a delicate exhibit may be damaged. Minimizing. If too many exhibits are passed, the impact of crucial exhibits is often minimized. 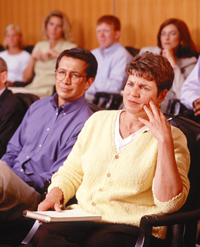 If you are going to pass an exhibit to jurors, first explain exactly what it shows: If an exhibit is simply passed, the jurors may overlook or misinterpret what you want them to see. Most exhibits should be explained/interpreted by a witness. The explanation can be brief (e.g., “this photograph shows the left front door, and here at the bottom you can see that the lower hinge was broken”), or it can be detailed and extensive. Whether or not the jurors handled the exhibit during trial, they may want to take it into the jury deliberation room as they decide the case. Under CCP §612, jurors may take “all papers which have been received as evidence … except depositions” and “any exhibits which the court may deem proper.” The trial judge will usually permit all exhibits that have been received and marked in evidence to be sent to the jury room, except when there’s a danger of misinterpretation, as with hospital records and X-ray films. For more on handling exhibits during trial, turn to CEB’s California Personal Injury Proof, chap 8 and California Trial Practice: Civil Procedure During Trial, chap 13. And get an overview of personal injury trial practice—including handling exhibits and witnesses—in CEB’s program The Personal Injury Basics: Trial, available On Demand.